There is something quite special and iconic about that blue and red Decca logo. For me, it symbolises quality and the assurance that a recording is going to be of the highest standard and a valued addition to my collection. I’ve yet to have a Decca album that has disappointed, though I acknowledge my collection is modest at best. The Three Tenors – In Concert (Rome 1990) was the first Decca recording that I owned. It is a monumental concert, not only for classical music lovers but for music lovers in general. It was a pivotal moment where I believe classical music interspersed with mainstream acceptance, thereby later resulting in the ability for artists, such as Andrea Bocelli, to breach the bounds of classical music and become modern-day pop icons. Arguably, Pavarotti achieved this acceptance prior to this landmark concert, but the concert signalled what was possible to the following generation. While classical music astounds me, regarding the way it captivates my mind and soul, I don’t class myself as a classical connoisseur. I know very little about the history, interpretational styles, and musical talents of the orchestra and conductor. To be honest, I’d like to keep it that way as I feel knowing too much about the process can become detrimental to simply enjoying the art form. This is one reason why I no longer watch the making-of documentaries for films as the magic of the fantasy world is eroded. I like to be taken on a journey. I like to leave the vessel of my body and allow my mind to travel beyond mere conscious thought. That is how I feel about classical music. It paints a picture, a story, with music. The story is my own, for only me to interpret. It is the purest form of subjectivity and as the vision in my mind lifts my soul to that special place, the troubles of the world cease to exist. It is as cathartic as meditation and better yet, my thoughts are welcome when I listen to classical music; whereas a squirrel is ever-present in the silent world of my mind when meditating. In this particular genre of music, I cease to care about what the composer could have been thinking as he wrote the piece. That is irrelevant to me as I search for my own subjective interpretation. Similarly, while I acknowledge that the conductor and orchestra will interpret their own meaning, their interests don’t factor into my evaluation of the performance either. I either like the interpretation, or I don’t. Interpretations that fail to reach my soul are simply not worthy of being included in my collection. No doubt, they will appeal to someone, but I can only reiterate the importance of enjoying classical music subjectively; the way all music, of all genres, should really be appreciated. Perhaps most interesting is the fact that very few people know of my love for classical music. How could they when they see me wearing AC/DC t-shirts almost daily? To them, I’m a hard rock fan, but behind closed doors I can listen to Thunderstruck and follow it up immediately with I Adagio – Allegro non troppo. Yes, I’m a special kind of crazy, but good music is good music. I don’t discriminate and I implore you to try it. While I am listening to this HFPA release as I write this review, I was previously listening to Carl Cox’s All Roads Lead To The Dancefloor. Switching between these albums, and musical genres, felt perfectly natural to me. Similarly, my classical music collection is interspersed with all other genres. I don’t have to be in the mood for classical music, I just have to want to listen to this particular album and seek it out in the T section of my collection. As I have more than one Tchaikovsky album, the recordings are then catalogued in order of conductor. That is about as complex as I get when it comes to adding my classical collection to my library of music. As an early adopter of the High Fidelity Pure Audio (HFPA) Blu-ray format, I found myself exploring more music than I had previously before. While I have always appreciated classical music, I didn’t acknowledge the diversity until this new lossless format appeared on my radar. Yes, HFPA Blu-ray is largely a failed technology, but the discs thankfully remain compatible with all Blu-ray players. However, it was this technology that created a rebirth of musical exploration for me and would ultimately become the instigator behind my acceptance of TIDAL Hi-Fi. As a result, I can listen to just about every interpretation of Tchaikovsky’s 6th Symphony, but I like this one and tend to also turn to it when I only have access to TIDAL Hi-Fi. Normally, these HFPA releases would include an MP3 download code, but all Decca releases omitted that option. It was initially disappointing, but I’m glad they did that in retrospect as it forced me to search for other options for portable listening. I even purchased a few of the albums on iTunes, before I had TIDAL Hi-Fi, as I enjoyed them that much. This wasn’t one of them, but Janine Jansen’s glorious Vivaldi: The Four Seasons was. The Mastered for iTunes edition is very enjoyable and while it is unfair to compare it to the associated HFPA release, I would happily listen to the iTunes edition in a portable setting, especially with the Oppo HA-2 attached to my iPhone. One aspect that I also find intriguing about classic music is how familiar it is. I may not have an adept knowledge of specific compositions, orchestras, or conductors, but without a doubt, I can recognise the music when I hear it. I dare say Hooked On Classics and various film scores have had a significant influence in this regard. While my collection of Tchaikovsky is limited, I also have the HFPA release: Tchaikovsky: Ballet Suites – Wiener Philharmoniker/Herbert Von Karajan. My one-word review for that album is: exceptional! While I am still wet behind the ears with regards to my knowledge of classical music, Tchaikovsky, Valery Gergiev, and the Wiener Philharmoniker, I hope that my thoughts on this recording will resonate with you. I Adagio – Allegro non troppo is initially a subtly beautiful track. The DTS-HD Master Audio 24-bit/96kHz playback option, a trademark of the HFPA Blu-ray platform, creates that desired silent vibration that allows one to feel the music, rather than simply hear it. While the album is only presented as a 2.0 stereo track, I don’t feel as though I’m missing out by not having a 5.1 mix. That said, a 5.1 mix would have been desirable as the music whisks you away and the more encapsulated you can be by the sound, the better. As I’ve mentioned before, I’m no classical connoisseur, but I feel every nuance is perfectly presented. Every high, every low, and every mid tone note is relayed in what can only be described as a masterful performance. Of particular note is how well defined the string elements are within the mix. There are some classical recordings that pierce my ears, rather than my soul, and this is certainly not one of them. As I sit here enjoying I Adagio – Allegro non troppo, I am one with the orchestra as my system doesn’t skip a beat, running at only 50% of full capacity. Any louder and I would need to set up lawn chairs and sell tickets to the neighbours. What is relevant, however, is how well the 24-bit/96kHz transfer is at resolving high volume levels. I find, on the same system, that CD playback at this volume is unbearable, regardless of mastering. While CD/SACD is arguably the best format for classical recording, especially in comparison to formats such as tape or vinyl, the HFPA Blu-ray is the closest thing I have heard that could be classed as a true concert-like presentation. II Allegro con grazia is a swooshing passage that makes me want to jump up and dance gallantly around the room. When this happens, I know that the music has truly impacted my soul. This section of the 6th Symphony will be arguably the most recognised element of the performance as it has been included in numerous film scores over the years. It is a timeless piece and a pleasure to listen to. III Alllegro molto vivace is also well presented, but I do consider it to be the most complicated section of the 6th Symphony, from a listener’s standpoint. The constant changes in musical direction prevent me from settling into a rhythm. However, towards the end, the percussion sections are extraordinary in both their depth and clarity. It is not only an incredible recording, but it is a sonic masterpiece. IV Finale. Adagio Iamestoso – Andante settles down in a relaxed manner as it is time to reflect on the enormity of the performance thus far. It is the perfect ending to a performance that was Tchaikovsky’s final and ultimately is said to symbolise death and a possible foretelling of his own demise. Personally, I wouldn’t class the 6th Symphony as being devoid of life, if anything I feel as it is a celebration with the finale closing a chapter of life with its sombre tones. Overall, I feel blessed to have such a flawless recording on the HFPA format. While the TIDAL Hi-Fi edition of the album is presented beautifully, it just doesn’t feel quite as open and detailed as the HFPA presentation. The HFPA edition is presented in LPCM, DTS-HD Master Audio, and Dolby TrueHD formats. As usual, I prefer the DTS-HD Master Audio track and can confirm that it will shake the foundations while remaining crystal clear and free of distortion. To their credit, Decca Classics have reissued the 2004 recording beautifully. While I don’t have the CD to compare, the HFPA cover and booklet are reformatted to fit the Blu-ray case. I mention this as a positive point merely because a number of the run-of-the-mill Universal releases have cut corners in this regard as they merely reprint the CD booklet, on the larger canvas. The booklet, while brief, does contain a short history of Tchaikovsky, particularly regarding Symphony No. 6, for novices such as myself. While a much more detailed overview would have been appreciated, it is the music that I am truly interested in and there are countless books detailing Tchaikovsky that one can explore if one wishes to be better informed. While not all classical music is as accessible as Tchaikovsky, this recording is perfect for someone who is interested in classical music but has yet to form an appreciation for it as a form of art. While my children love Vivaldi’s Four Seasons and Tchaikovsky’s Ballet Suites, they are starting to thoroughly enjoy the 6th symphony alongside Lady Gaga and AC/DC. The Wiener/Gergiev recording of Tchaikovsky’s 6th symphony is truly worth owning and is one of my most prized possessions. 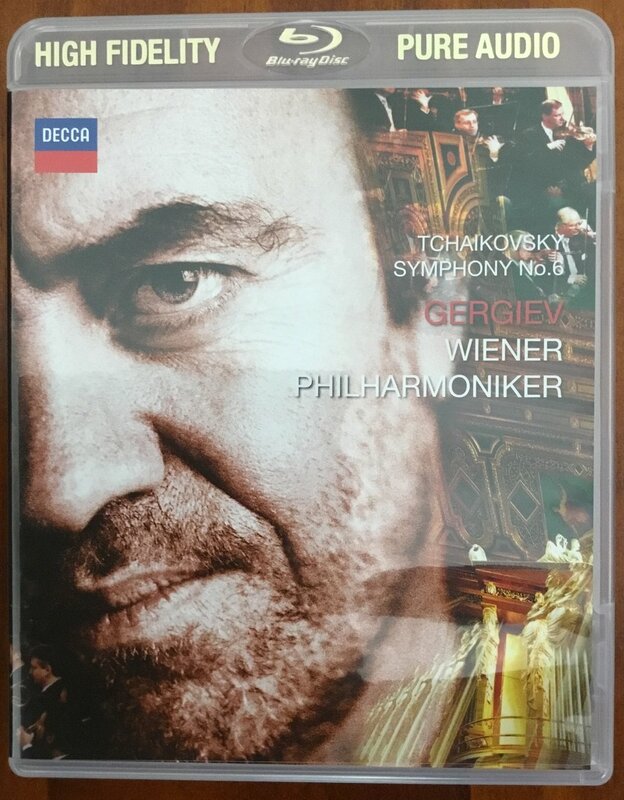 Tchaikovsky: Symphony No.6 – Wiener Philharmoniker/Valery Gergiev is also available on TIDAL Hi-Fi while still being available on HFPA Blu-ray.